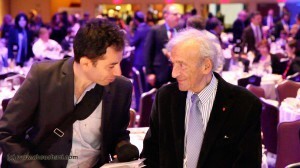 Filmmaker Michael Grynszpan and Elie Wiesel z.l. We’ve just learned the sad news: Elie Wiesel, Auschwitz Survivor and Nobel Peace Prize Winner, Dies at 87. Baruch Dayan Emet (Blessed is the True Judge). We had the privilege to meet him and to interview him last year in New York. Elie Wiesel was happy to talk about his mentor and master Shoshani (Chouchani). We believe this was his last filmed interview. This entry was posted in Uncategorized and tagged Chouchani, documentary, elie wiesel, film, genie, genius, Jewish, judaism, kabale, last interview of Elie Wiesel, levinas, memory, mentor, Mister Shoshani, monsieur Chouchani, Monsieur Chouchani and tagged Chouchani, Monsieur Chouchani Mister Shushani מר שושני, monsieur shoushani, mysterious, mystery, New York, גאון, הראיון האחרון של ויזל, יהודי, מר שושני, שושני on July 2, 2016 by Monsieur Chouchani.